Angela Fulbright-Burley teaches her eighth grade history students at Zumwalt Middle School. The Dallas school district launched a program last year designed to turn around its most troubled schools. It’s called ACE – accelerated campus excellence. Last year, six of the seven ACE schools got off the state’s improvement required list. “Who makes the most money?" asks the history teacher. "England," say the kids. "England makes the most money…"
We’re in Angela Fulbright-Burley’s first period history class. This small group of eighth graders at Sarah Zumwalt Middle School is tackling early American mercantilism. “England’s mean,” one student says. “Why do you say that?” Fulbrigh-Burley asks. “Cause they’re selling it for higher when they sold the natural resources for lower,” the student says. These kids are curious, active, engaged. Their teacher says it didn’t used to be that way. Angela Fulbright-Burley says last year was hard. And she’s good. But that’s why she’s here. Zumwalt consistently underperformed. So this school and six others practically started over, with new, top-rated teachers and principals. This is Zumwalt’s second year in the ACE program. How much? Just ask the kids. Eighth grader Josh Bullock, who’s 13, is in his last year at Zumwalt. “Before they came it was like, really rowdy and bad. It had no structure,” Josh says. Structure’s what appealed to eighth grader Kentavia Davis after witnessing fighting and mayhem. 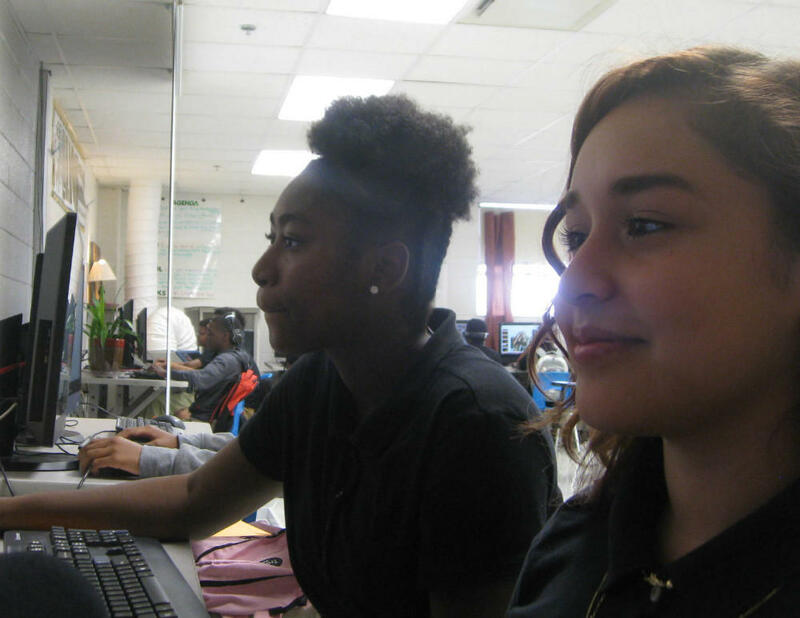 Kentavia Davis, left, sits next to fellow eighth grader Nancy Hernandez. Both were at Zumwalt before and after the ACE program. The difference? Both say mayhem used to rule and learning was hard. Now there's structure and learning's fun. This shift in Zumwalt’s culture? Annie Wright says it’s major and difficult. She runs the Center on Research and Evaluation -- CORE -- at Southern Methodist University’s education school. “They’re hard to accomplish, they’re worth celebrating and ultimately those are the kinds of changes that then start to point to academic outcomes and test scores that are eventually what make the headlines,” Wright says. The ACE program was one of former superintendent Mike Miles’ reforms. And his successor, Michael Hinojosa, wanted more money for additional ACE schools. Trustees said they needed more data to confirm the improvements before asking voters for the money. Ron Olive is convinced the proof’s already in. He’s an ACE teacher at John Mills Elementary. He says waiting wastes time kids may not have. Frustrated, the highly-ranked art teacher signed up for the ACE school. There’s more pay, in part, because he works longer hours. For him, there’s a different payoff. How much of a difference is still a question. Performance gaps among African American and Hispanic students compared to whites, remain. Yet in some ACE schools that gap shrank - in some cases - 30 points. But getting it to zero? That may take more than any standout program can provide. The Dallas Independent School District is paying its teachers differently this year. The new system bases pay on merit, not years of service – and student evaluations also play a role. Some teachers love the Teacher Excellence Initiative, while others blast it. Eleven years to the day since 9/11, memories remained strong Tuesday at ceremonies across North Texas.